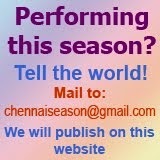 Chennai December Season 2018: Plan your peak season schedule! Chennai starts experiencing the flavour of music and dance from early November with a few major sabhas like Bharatiya Vidya Bhavan and Carnatica hosting their events very early. However, the peak 'season' is on from Dec. 15 for many of the concert hoppers. The office goers prefer to take a break a week before Christmas. They love to settle down in cozy chairs in mildly air-conditioned halls and enjoy the hot pakodas, bondas and filter coffee in between! If you are yet to plan your peak season concert schedules, here are two guides / planners to choose your favourite artistes or venues or dates. 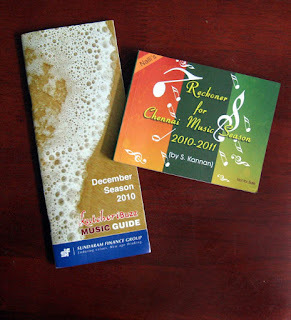 The small pocket book of concert reckoner compiled by S. Kannan and supported by Nalli was released on the inauguaral day of Brahma gana Sabha festival on Dec. 4, 2010. This book is available at all Nalli stores in T.Nagar, Adyar, Anna Nagar, Sriram Nagar - Alwarpet apart from S. Kannan's place at 2nd floor, Sundaram Apartment, 3, Anandapuram, Off Dr. Rangachari Road, Mylapore. 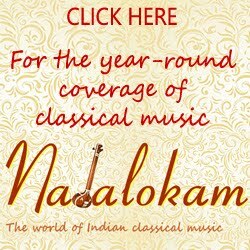 Kutcheribuzz.com publishes an oblong pocket guide listing major concerts in various sabhas in Chennai. This book is available at Kutcheribuzz office at 2nd Floor, Corporation Shopping Complex, 77, C.P. Ramaswamy Road, Alwarpet. Both these books are distributed for free and you really need to be early at the pick up points to be lucky to have them.